Before leaving the I Ain’t No Saint Studio you will have been given our synthetic skin or clingfilm healing method. Below you will find healing instructions for both, please follow the one that was applied when in the Studio. 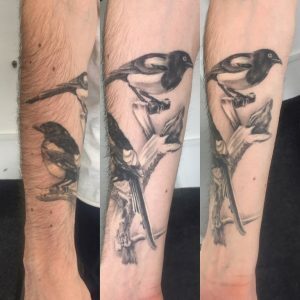 We only recommend using Super Tattoo Sauce to moisturise & heal your new Tattoo. It is available from the Studio and online here. Always wash your hands before applying the Sauce. 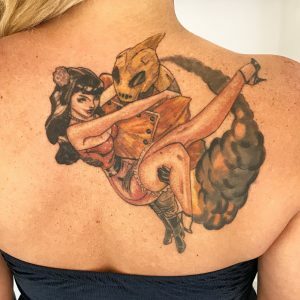 Do not touch the new Tattoo unless you are applying Sauce – we know it’s hard, but leave it alone! 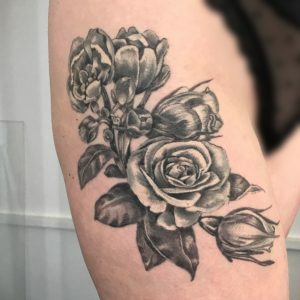 All pictures above are healed tattoos, we feel it is important that our customers can see healed work from the Studio that have not been Photoshopped. If you like what you see contact us and get booked in! If you need more Super Tattoo Sauce you can grab a bottle from the I Ain’t No Saint Studio or order some online here. Any other questions? Just get in contact with us!